Now FollowingLike works with facebook, instagram, google+, linkedin, reddit, tumblr and pinterest. You can run these sites' tasks in one software at the same time. And we are adding more popular sites like twitter, snapchat and myspace etc. And soon, you can create a task to mix different sites' function to finish a complex task. Add/Remove friends from searched people or imported list automatically. Search pages/posts/people base on the keywords you input and use by other module. Search people's followers and following to be used by other module like follow,unfollow and send message etc. You can also save the searched data directly. Auto search userposts, search friend, search groups. Auto like comments and auto reply Commets. Auto create groups, invite user on groups, join groups, leave groups. Search the post's author/likers/commenters by the post information. Auto send message to the imported/searched out pages. Search the interactive/non-interactive users by date. The interaction search type can be: commenters/likers/inviters from your account notification. Search the group members/page likers by the imported/searched out links. Auto invite your account friends to like your pages. Auto add friends to the imported/searched out groups. Get the users associated with me. Auto post by the imported/searched out photos and the added tags. Auto-follow searched/imported/newest Collections base on the keywords you settings. Auto-Join searched/imported/newest Communities base on the keywords you settings. Auto-like/vote/plus searched/imported pages base on the keywords you settings. Auto-comment searched/imported pages base on the keywords you settings. Auto-share searched/imported pages base on the keywords you settings. Search people base on the keywords you input and use by other module. Also can find the newest people. Search posts base on the keywords you input and use by other module. Also can find the newest posts. Search collections base on the keywords you input and use by other module. Also can find the newest collections. Search communities base on the keywords you input and use by other module. Also can find the newest communities. Auto-like/Share/comment the searched and imported update. Auto-follow searched/imported/newest Companies base on the keywords you set. Auto-follow searched/imported/newest Universities base on the keywords you set. Search update base on the keywords you input and use by other module. Also you can find the newest update. Search people base on the keywords you input and use by other module. Also you can find the newest people. Search posts base on the keywords you input and use by other module. Also you can find the newest posts. Search companies base on the keywords you input and use by other module. Also you can find the newest companies. 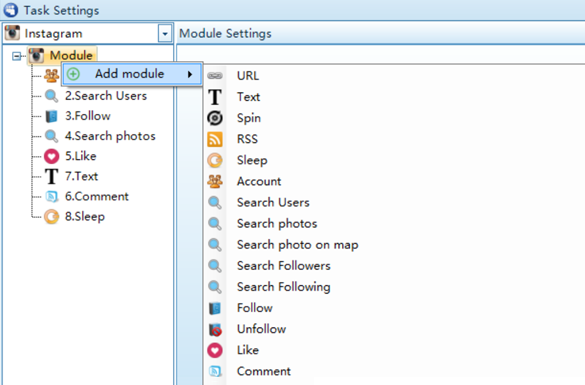 Search universities base on the keywords you input and use by other module. Also you can find the newest universities. Auto send invitation, send message to connections. Auto like comments, reply comments. Advanced people search, search connections, search posts by people. Auto endorse the imported/searched out user's skills. Auto-follow/unfollow the searched boards base on the keywords you input. Search pin base on the keywords you input and use by other module. Search pinner base on the keywords you input and use by other module. Search boards base on the keywords you input and use by other module. Auto invite the imported/searched out users to the imported/searched out boards. Add friends from searched people or imported list automatically. Search various posts by the imported subreddit. Search Subreddit base on the keywords you input and use by other module. Search new, top, and controversial post by the imported user. Auto send message to the imported user. Auto send post on the subreddit. Auto send post by the settings of Audio, chat, link, photo, quote, text, video and title. Manage thousands of accounts and categories easily. Easy and no api limit. You can set a black/White list for follow, unfollow, like and direct message etc..., then all tasks will use the black/white list when working. 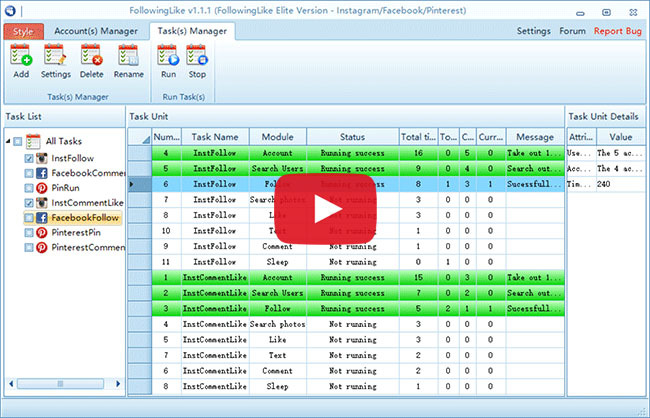 When run follow, unfollow, like, post and comment etc, you can not only input data, import data list and read file, but also get get data from rss and other module's output. There are many different data source you can use. Your content can be spun to many different new content automatically. We have designed FollowingLike to be a very smart program. Every basic function(follow, unfollow, comment, like, search and get content etc.) has been designed and divided into basic module, you can combine, mix and sort these modules to generate any task you want. Every output of one module can be used as input parameters of another module. This gives you the smartest way to customize your tasks. The Account Manager makes it easy to save your accounts by category or campaign, you can see all the important details of the accounts in one table - very clear! When you select accounts to run a task, you can select either one category or multi-category accounts to run the task, this will help you to manage your campaign accounts very well. The main functions in the account manager form are: add account category, add account, import accounts, export accounts, delete accounts, check the details of selected accounts! This function lets you bind accounts with appointed proxies, so that later the program will use the same proxy with this account all the time. This will make your account much safer. These sites don't want to see that you are in USA now and then you are in England after 1 min. You can set every account to use a different proxy, you also can set every 2 or X accounts to use the same proxy. The program can also use the conventional proxy rotate method of using a different proxy every time the account logs in. It's very smart, it's all is down to your settings. And FollowingLike's operation is same to human's operation, this will avoid your accounts got suspended.